Is the McDonald’s Corporation Dividend Sustainable? The fast food giant's dividend payout ratio just hit 80%. Time for investors to worry? With 39 straight years of payout boosts under its belt, McDonald's (NYSE:MCD) is a true dividend aristocrat. Through dozens of market booms and busts, income investors have been able to count on the fast food king steadily increasing the size of its payout. Yet the company's dividend is in unfamiliar territory right now. Customer traffic is slumping around the globe, and profits are plunging. 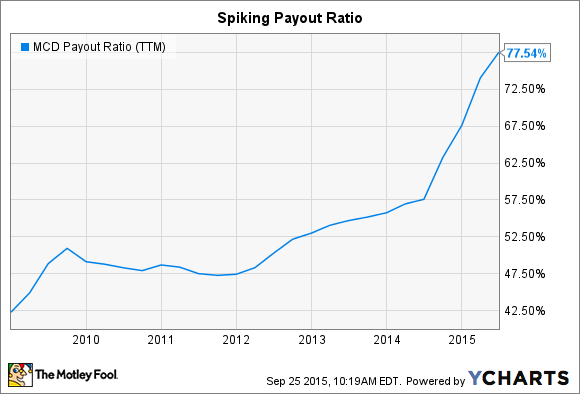 In fact, the payout ratio recently spiked to an uncomfortable 80% of earnings. To be sure, McDonald's finances remain incredibly strong. The company generated $7 billion of cash last year -- over two times its annual dividend commitment. A cash-rich business model makes it unlikely that we'll see a pause to payout raises any time soon. But income investors shouldn't be surprised to see a period of weak dividend boosts that aren't completely funded by rising earnings. After all, profits are down 22% through the first half of this year after dropping by 15% in 2014. Some of that dip is just a temporary effect of weakening foreign currencies. Last quarter's 20% reported profit dive in Europe, for example, amounts to just a 2% hit once you adjust for foreign exchange rate swings. Overall, McDonald's 22% earnings slump this year is really a 13% pinch on a constant currency basis. Keep that in mind when you see the payout ratio climb closer to 100% of reported earnings. Also remember that the currency-fueled financial pressure will end as soon as foreign exchange rates settle down. But McDonald's profit troubles have an important operational element to them as well. Competition from healthier fast casual chains has forced customer traffic levels lower across all of McDonald's markets. And here in the U.S., a string of promotions and menu innovations haven't stopped the exodus of fast food customers toward competing chains: Sales at existing locations fell by 2% last quarter despite management's best turnaround efforts. "Our second quarter results were disappointing," new CEO Steve Easterbrook admitted in a press release. Easterbrook also said that the company is seeing "early signs of momentum" at its restaurants that could drive a return to positive comps growth as early as this quarter. Investors have heard that kind of optimism from executives for more than a year, and it hasn't panned out yet. But management isn't counting only on improving operations to fund growing cash returns to shareholders. The company is also aggressively selling off its restaurants, with plans to refranchise 3,500 locations by the end of 2018. The main drawback to that strategy is less control over the brand and the dining experience at its 35,000 global stores. But in exchange, refranchising will raise plenty of excess cash, lower costs, and provide for a more consistent earnings stream. Once the franchising strategy is complete, McDonald's expects to control just 10% of its global restaurant base, down from 22% at the end of 2014. That massive financial shift explains how McDonald's can target returning $9 billion to shareholders this year (compared to $6 billion in 2014) -- even as profits fall for the second straight year. Most of those rising returns are coming in the form of share repurchases right now: Dividend spending so far in 2014 has been $1.4 billion, compared to $2.3 billion on stock buybacks. Meanwhile, McDonald's dividend growth pace fell to 5% this year from 9% in 2014 and 13% in 2013. Continued earnings pressure could keep the next few raises in the low single digits, but shareholders have no reason to fear a pause or rate cut. They can also expect to see rising overall cash returns headed their way at least through 2018.